Whatever your goal might be, our experienced team can make your dream a reality. Elie's Home Improvement provides kitchen, bathroom, and basement remodeling services by licensed and insured contractors based in Huntington Woods, MI. Our expert team is committed to working with you to give you the home of your dreams through expert remodeling and improvement services. We are a small, locally owned and operated business, and because of that we are highly focused on pleasing every single customer. Elie's Home Improvement, LLC was established in 2001 and we have been working closely with clients on a personal, one-on-one basis ever since. Let us put over 15 years of home improvement and remodeling experience to work for you! Besides Elie's excellent workmanship, I appreciated his honesty and willingness to work within the parameters I had. The TLC that was given to my kitchen, bath, and living room exceeded my expectations. 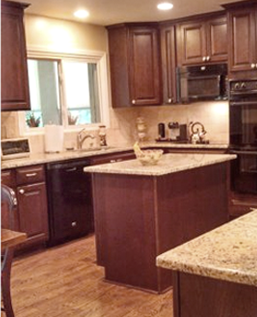 I love showing off my kitchen and bath and would certainly have Elie back to do further work as needed. Watch Our Feature on Channel 7 News! Vietnam Veteran Don Brock was scammed by an HVAC Contractor who not only took his money, but did not complete his repairs. When we heard of the situation, the Elie's Home Improvement team visited Brock, and completed his needed repairs at no cost.